Baraka Was One Of The Best Blu-ray Movies of 2008. Roger Ebert said, "Baraka by itself is sufficient reason to acquire a Blu-ray player." That is a pretty strong recommendation, don't you think? Bakara is a 1993 film that has been fully restored. This movie was filmed in 24 countries and is a world tour that shares the human condition, the sights and the sounds, in a new way -- without plot, speaking or narration and with time-lapse photography. I have not seen it nor had I heard of it until I saw it on Sound and Vision Magazine's list. Now that I have spent some time researching it, I would say that it definitely sounds like an interesting film, perfect for the blu-ray format. Reviews include comments like P. Kowlasky's "This new transfer is AMAZING, and is exactly what the first DVD release should have been... PRISTINE video (very few artifacts, little or no pixelation), and IMMACULATE audio (crisp, clean, and great presence without sounding "over-processed")." Jazzlady2 said, "I firmly believe ALL PEOPLE should view this film at least once in their lifetime--free from all external encumbrances - this film requires your undivided attention. All of a sudden, the world becomes a much smaller planet - one in which we all live in our own way and one in which every living being is important. If you are prone to cry at beauty - have a box of tissues handy. If you are not prone to cry at films, have a box of tissues handy anyway. You will probably need them. This is a very moving film. I was particularly impressed with the burning oil field scene because of the intense feeling the film created." Blu-ray.com said, " No collection, small or large, is complete without a copy. Baraka received their highest recommendation." TheHDRoom said that the unique filming techniques, enveloping score and beautiful photography work together to create one of the most hypnotic high definition presentations to date." Baraka is on my I'd like to see list. Does it interest you? 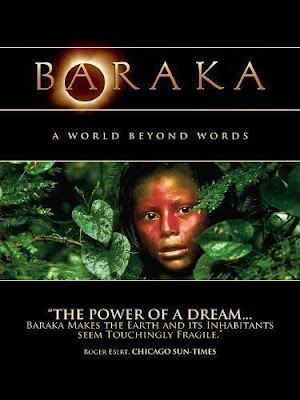 Click here to order your copy of Baraka from Amazon. Please note that I this post was originally written for another website in 2009.